A revolution is quietly going on in the broadcast TV equipment industry and you’d be forgiven for not knowing anything about it. It’s the remarkable move beyond High Definition video to ever increasing (and dizzying) resolutions. While the rest of us are weighing up the pros and cons of upgrading our TV’s to High Definition, and broadcasters are still struggling to upgrade their equipment to handle High Definition, companies that supply the TV industry with cameras are pushing ahead with remarkable innovations that have left cinematographers and directors like Steven Soderbergh and Peter Jackson in awe. Your current TV set, assuming it’s not high definition, has a resolution of 625 lines, or 525 if you’re in North America. This means that 625 horizontal ‘rows’ are used to generate your picture. This is known in the trade as Standard Definition and, remarkably, has been the same system in use since World War 2. Sixty odd years later we are finally seeing an upgrade to our TV’s, and the new high definition sets feature 1080 lines of resolution, or approximately double what we had before. Because a TV has two dimensions, horizontal and vertical, and both of these have been increased by a factor of 2, this means that a high definition picture has approximately 4x the picture detail of a standard definition one. Just remember your area formulas back in school. But what if I told you that a camera is currently being tested by the broadcaster NHK in Japan that has nearly 100x the picture detail of a standard definition TV? So called Ultra High Definition TV has a resolution of 4320 lines and would mean you could have a TV set the size of your living room wall, with no less quality than a high definition set has now. This would make AT&T’s current TV ad in the States, showing a man watching the outside world through his window (as if it were a TV), rather prescient. But while NHK grapples with some rather (necessary by design) kludgy approaches to getting UHDTV to actually work, other companies are pushing on with higher than high definition resolutions and getting cameras out onto the market. The leader in this field is a California based company called RED, who stunned the industry last year with the launch of a camera that has 4x the resolution of HD, yet is priced significantly lower than many professional HD cameras. The Red One costs around $17,000 and offers resolution of 4096 x 2304 pixels. Note that the smaller of these two numbers is the equivalent to the ‘number of lines of resolution’ figure used above. 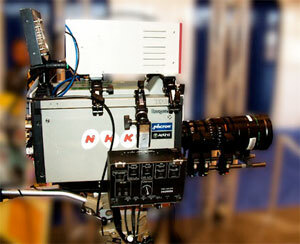 Now this may sound like a lot of money, but in the broadcast industry cameras typically cost $50,000 plus. 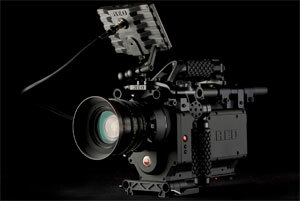 A new camera from RED called the Red Scarlet due in early 2009 is promising to offer almost the same resolution as the Red One, but at a cost of just $3000. All of a sudden, this means aspiring film makers and Directors will have access to technology they could never have dreamed of before. You may ask… what is the point of having such a high resolution camera if we don’t have the TV’s to actually play it back on? Well this is where the law of ‘capture content at the highest resolution’ comes into play. It was the same a few years back with sampling audio at ever increasing frequencies, and it’s the same now with video. Basically there is an advantage to be had from capturing footage at a higher resolution and downsizing it much later once special effects and other changes have been applied. At the very least your footage is future-proofed for when much higher definition TV’s become available in the future. One problem it creates is a nightmare during post-production which is when you edit your soon-to-become blockbuster. Post production companies (who supply facilities for this kind of thing) are still reeling from the changes they’ve had to make to handle HD, as it has affected almost every piece of the rather expensive equipment they use. Cutting edge film-makers walking in off the street with footage shot on a Red One camera only create more problems that need to be solved, and push the data storage requirements for all this footage off the scale. So what does it all mean for you and I? Well the fact of the matter is that resolutions above High Definition and in particular Ultra High Definition are unlikely to appear in TV sets for at least a decade. It’s taken 60 years to get us to make one upgrade and there are way too many parts of the puzzle that need to change for your purchase of an HD set to be in any way a mistake. But as we’ve seen with the ever increasing Megapixels arms race in digital cameras, the manufacturers are always looking for ways to tempt us to buy newer gear and now they seem to be turning their attention in this area to the poor souls who have to make purchasing decisions within the TV industry. Update: I had the good fortune to be invited to a special demonstration of NHK’s Ultra High Definition System put together in partnership with the BBC and Italian broadcaster RAI, and it was simply awesome! Previous Post Google launches steam cleaning company… no wait!